A couple of days ago I was at a party where a couples a geeky guys were playing with tiny remote-controled helicopters toys. 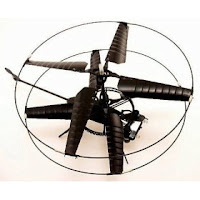 They were a few inches in diameter, extremely light and almost silent (powered by batteries). Although extremely hard to control due to their small size and their lack of inertia because of their extremely light weight, they were a lot of fun to play with, so I decided to get one! I followed the advice of one of the guys and got a dual-rotor model, which is more stable and easier to control than the single rotor design. After a few hours of playing with the toy and crashing in counteless times, I'm now able to do (almost) controled flights around the rooms in my apartment, and even fly the chopper from room to room. What's really amazing is that they were able to build such a complex machine with a very simple and very light design, and make it extremely robust (it survives the hardest crashes). The rechargeable battery allows flights up to about 5 minutes. The three brushless electrical engines powering the chopper are extremely small yet very powerful and very efficient. Amazing technology, worth the $50 or so (i think you can get it for less on-line).